Last week, HRM council took the first step toward repealing the municipality's pesticide regulations, a move which has some citizens groups concerned. The repeal would bring HRM's bylaws in line with current practice. City staff stopped administering the P-800 bylaw in 2011 when provincial legislation on the sale of cosmetic pesticides came into effect. The new provincial law was considered to make the HRM bylaw redundant. But that's not the case, say proponents of HRM's bylaw. A coalition called Pesticide Free Nova Scotia (PFNS) has written to Halifax mayor and council asking them not to repeal the pesticide bylaw because it offers important protections not covered by provincial law. 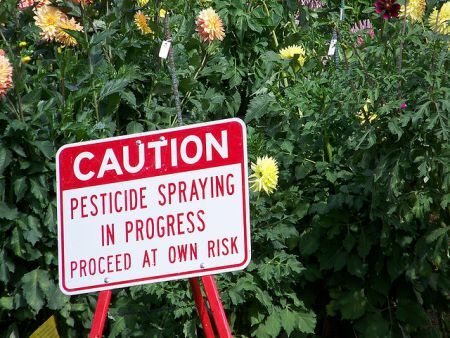 Among the key differences is a municipal requirement to post warning signage 24 hours before spraying a controlled pesticide, and to verbally inform neighbours within a 50 metre radius. "This gives the opportunity for vulnerable people (pregnant women, families with children or pets, the elderly, the pesticide sensitive, cancer patients and others with serious illnesses) to vacate their premises during and after spraying," says the letter from PFNS members. Provincial legislation only requires signage after spraying occurs. Halifax’s municipal legislation created pesticide-free buffer zones around schools, daycares, hospitals, clinics, churches, senior citizens’ residences, universities and churches. Buffer zones don’t figure into the province’s legislation, says PFNS. Another key difference is HRM's permitting system, where residents or landscaping companies wishing to use a controlled pesticide would seek approval from city staff or contractors. HRM reps would visit sites in person, assess the problem, and then either advise non-toxic alternatives or grant permission for the use of the controlled pesticide. Provincial pesticide regulations work differently, placing controls in stores where pesticides are sold. Controlled pesticides can only legally be sold by retail staff trained to advise consumers on the spot about non-toxic alternatives to treating their lawns. But that isn't necessarily happening in Nova Scotia stores, according to an informal audit conducted by Pesticide Free Nova Scotia in 2013. As previously reported by the Halifax Media Coop, PFNS volunteers conducted a "mystery shopper" survey of 21 retailers in Nova Scotia in 2013. They found only 3 in full compliance with the province's rules. And fourteen stores had controlled pesticides available directly to consumers without trained staff consultation. The 2013 audit showed that compliance with provincial pesticide regulations had actually gotten worse since the law first came into effect in 2011. The HRM bylaw has seen more success. Over the 8 years that the pesticide bylaw program ran, the number of approved applications for controlled pesticide use dropped dramatically, from 3,505 in 2003, to just 43 in 2010. The number of public complaints under the bylaw also dropped significantly, down from 400 in 2001 to just 19 in 2010. But that doesn't mean we should stop enforcing the bylaw, says long time anti-pesticide activist, Florence Senay. "It's like a stop sign. You don't say, well, we might as well take it away because no one has been hit by a car in a long time," says Senay, who is calling for HRM to not only leave P-800 on the books, but to start enforcing it again. HRM's pesticide program cost about $150,000 per year until 2010, when costs dropped to roughly $30,000. In the 2010 season site visits were taken on by HRM permanent staff instead of being contracted out, and the education component of the program was eliminated. So far, councillors have passed first reading of the bylaw that will repeal P-800 (Respecting the Regulation of Pesticides, Herbicides and Insecticides) along with 5 other older bylaws now considered redundant. Councillor Jennifer Watts voted in favour of first reading, but expressed concern about the inclusion of the pesticide bylaw. "That was a very important piece of legislative work done by HRM," said Watts. "I would have like to see this come to the Environment and Sustainability Committee." The Pesticide Free Nova Scotia coalition includes the Ecology Action Centre, the Canadian Cancer Society, and Real Alternates to Toxins in the Environment, among others.